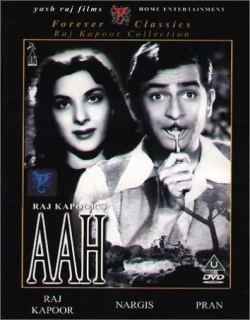 Aah is a 1953 Indian Bollywood romance, musical, family drama, social film released on Jan 01, 1953. 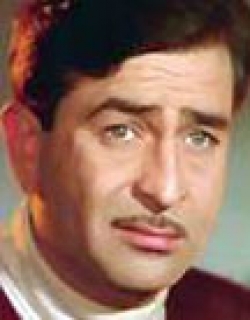 The film is directed by Raja Navathe, produced by Raj Kapoor under banner named R. K. Films. Raj (Kapoor), a poet at heart, is the chief engineer in charge of building the Saraswati dam. Rajs father wants him to marry the glamorous Chandra (Vijayalakshmi), but he loves Chandras sister Neelu (Nargis) who shares his poetic inlinations. Raj discovers that he has tuberculosis. He then pretends never to have loved Neelu and perusaded a doctor friend to marry her. Raj also pretends to love Chandra and so to prove to Neelu that he is an untrustworthy man. All his lies create far greater emotional problems that the disease itself but Raj and Neelu do eventually unite. Although one of Kapoors less memorable films, it remains important as one of the first movies to deploy the very popular melodramatic device of the hero suffering nobly from a terminal disease. Masochistically wallowing in his suffering whie arrogantly sperading misery all around, the infantile yet paternalistic hero, presented as a realist, denies the heroine, presented as an uncurable romantic, the chance to make up her own mind by telling her lies. This device allows for a great variety of twists in the plot and countless displays of emotion. Here, an extra oppopsition is woven into the plot; the city/country dichotom, with good tribals and workers being faced with urban profiteers. The ending sees good (country and love) triumph over evil (money and disease). In Bobby (1973), a tribute Kapoor paid to his own early work, some shots of Aah are reprised. He also incorporates a reference to the popular Devdas (1935) by having the dying hero make his way to his beloveds village in a cart, as Devdas did. [Source: Encyclopaedia of Indian Cinema] Check out this page for more updates on Aah. This page provides latest and updated information about Aah (1953) movie which released on Jan 01, 1953. Aah (1953) is directed by , produced by , starring .We have also provided 0 trailers and videos, 2 photos, 32 user reviews, and 0 critic reviews.Aah (1953) has received 2 rating from user reviews.The overall rating of Aah (1953) is 40 and movie is 2.You can review, like, dislike this movie and also can add to favorites. You can also find information on showtimes, CDs, DVDs, online rental, online free watching.